Here's a figure that struck us - 13 percent. Just 13 percent of American workers in the private sector have paid family leave through their jobs. This is our series about the lives of working parents, Stretched. But over the past year or so, there has been a wave of companies announcing new or greatly expanded paid-leave policies. There are big tech companies like Microsoft, Facebook and Twitter. SHAPIRO: Food companies like Nestle and Anheuser-Busch. CORNISH: Not to mention clothing companies Levi Strauss and Nike. SHAPIRO: And banks - Wells Fargo, Bank of America. CORNISH: And joining the trend this year - the Hilton hotel chain. Now, they've extended paid parental leave to all employees, from top managers to housekeepers. And that kind of comprehensive policy's actually pretty rare. NPR's Jennifer Ludden has this report on how the company's policy is working out. SHAPIRO: Before we listen to it, though, we need to mention that Hilton is an NPR sponsor. But they have no involvement in our coverage. JENNIFER LUDDEN, BYLINE: In the two-story breakfast room of Hilton's Conrad Miami, Florance Eloi works the omelet stand. FLORANCE ELOI: What are we having this morning? UNIDENTIFIED MAN: Egg-white omelet, please. LUDDEN: Eloi is a bubbly Miami native. She loves advising tourists on what to see and loves the stunning sunrise view from this room on the 25th floor. ELOI: People come, and they order their omelets. And they're like, stop making the omelets. You need to turn around and look (laughter). LUDDEN: Late last year, Eloi discovered she was pregnant. Before she could worry about how to handle a baby with her job, managers told her about Hilton's new policy for its 40,000 U.S. workers. She'd get 10 weeks of fully paid parental leave. She told me about it during a break in her shift. ELOI: I intended to stay until, like, my due date. But, of course, I didn't know - first-time mom. LUDDEN: Eloi says she became too exhausted to stand all day. So she stopped working one week before the birth. Along with vacation, she took a total of 13 weeks off and says it was a life saver. Her husband, a chef at a local restaurant, has no parental leave. Without hers, Eloi says she would've had to come back far too early or dip into savings. She was grateful to recover physically and bond with her son, Caleb. ELOI: Get to know him - what makes him cry, makes him calm. I was able to spend all that time doing that. LUDDEN: Now, Hilton says it's not budgeted extra money for this. What if there's a baby boom in housekeeping? The hotel manager would have to cut back elsewhere to pay for temp workers. In Eloi's case, her boss cross-trained the staff. And everyone pitched in. That might be tough for a small business. But Hilton says it's doable for their multinational company. MATT SCHUYLER: There was absolutely no peer pressure in this regard in our industry. We are first and now quite out in front with respect to this. LUDDEN: Matt Schuyler is Hilton's head of human resources. He says the new policy was driven by employee demand. 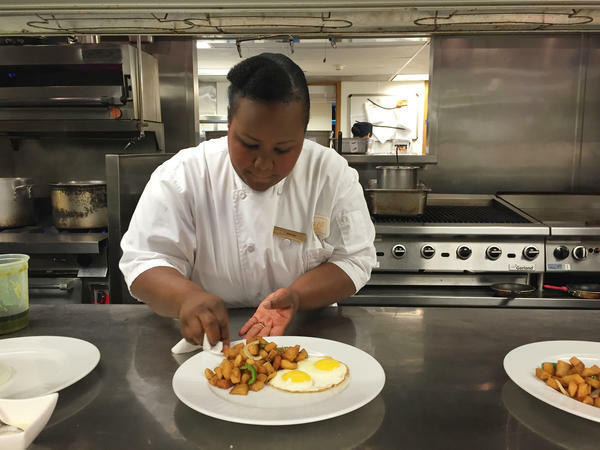 Millennials - young adults under 35 - are nearly half of Hilton's workforce. And they'll soon be three-quarters. Research, including the company's own surveys, shows they care a lot about paid leave - both women and men. SCHUYLER: And so for us, it wasn't about cost-benefit analysis. It was about being able to attract and retain the workforce of today and the workforce of tomorrow. LUDDEN: Though, as advocates see it, Hilton's paid leave is a bit yesterday. Men only get two weeks. And the leave can only be used to care for a new child. Another push for the policy - Schuyler says Hilton operates globally. It saw the disparity in paid leave. SCHUYLER: We do it by law in the majority of the countries you do business in. So it wasn't an unnatural thing to administer. It was just more of a - let's not wait for the mandate. Let's do the right thing here. VICKI SHABO: The numbers have grown over the last year. The conversation has really shifted. LUDDEN: Vicki Shabo is with the National Partnership for Women and Families. She's still amazed at one sign of this shift. Both presidential candidates are proposing a federal program for paid parental leave. This comes after dozens of cities and several states have passed their own policies. SHABO: So I think the private sector is also anticipating that policy changes may be coming and trying to get ahead of that curve, as well. LUDDEN: Millennials may be the biggest force for paid leave. But Shabo says they're not the only ones who need it. More companies are also including those who must care for older parents. SHABO: There's a huge, huge caregiving tsunami coming. The population is aging. And this is creating a lot of pressure on employees to have to manage those work-family obligations at all stages of their lifespan. ELOI: And would you like whole eggs or egg whites? 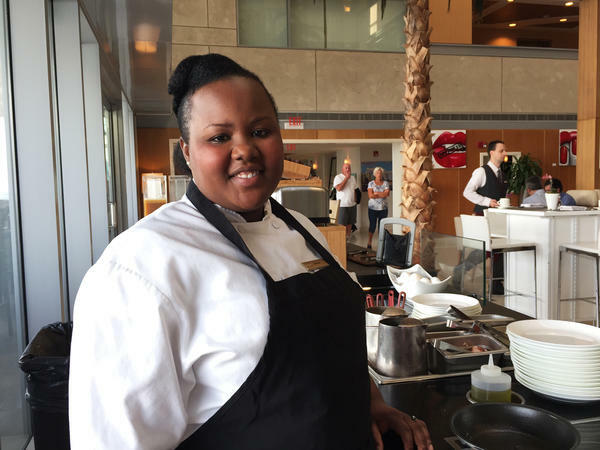 LUDDEN: In Miami, new mom Florance Eloi's already been with Hilton two and a half years. Turnover in the hotel industry is high. But she says she'd have to think twice now before leaving. She can't imagine having a second child without paid time off. Jennifer Ludden, NPR News. SHAPIRO: As we heard in Jennifer's piece, there is talk of national paid leave here in the U.S. Some fear that kind of program could discourage the private sector from offering paid leave. CORNISH: Stephen Spizer (ph), and American living in Australia, says that isn't the case there. Australia has a paid parental leave law. So when he and his wife had a baby, Spizer was guaranteed 18 weeks paid leave at the Australian minimum wage. But Spizer took the time off at his full salary. His company made up the difference. STEPHEN SPIZER: It's been really interesting, you know, on top of the government program to see how quickly the private-side employers have started to really up their game as far as the entitlements. CORNISH: We'll hear from more parents as our series Stretched continues. Transcript provided by NPR, Copyright NPR.